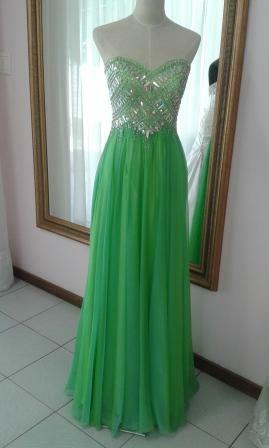 Green soft flowy fully beaded sweetheart bodice. Contact number 012 653 0318 - 104 Willem Botha Street, Eldoraigne, Centurion. We dont work on appointments but fitting fee apply. Hours Monday - Friday 8h30 - 16h00 Saturday 8h30 - 12h00 Not open on Sundays.